Has your dentist in St. Louis started using laser dentistry ? 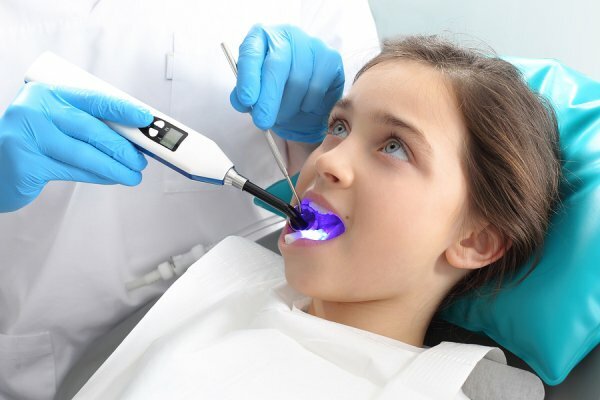 Laser dentistry is an innovative new technique in family dental care that allows dentists to perform both routine and complex procedures without a dental drill. With laser dentistry, patients feel virtually no pain, vibration, or noise. Additionally, dentists are able to complete multiple procedures in a single appointment. Continue reading for some answers to frequently asked questions about laser dentistry. Laser dentistry works when a dentist relies on a laser instead of a scalpel to perform dental procedures. With laser dentistry, dentists can do everything from filling cavities to performing root canals. Dental lasers can even be used to reduce the discomfort of cold sores or canker sores. With surgery, dental lasers act as a cutting mechanism. But dental lasers can also be used to “cure,” or set dental fillings and other bonds. Laser dentistry is a general term, so you should ask your dentist which kind of laser he or she uses. Lasers have been used in dentistry for over two decades, and dentists regularly praise their reliability. However, the best part about laser dentistry is that it cuts down on a patient’s pain—and time spent in a dentist’s chair. With laser dentistry, dentists perform hard and soft tissue procedures with no anesthesia and virtually no bleeding. Because lasers are so much faster invasive than scalpels, dentists can execute formerly complex, multi-appointment procedures in just one appointment. How Is Aftercare Different with Laser Dentistry? Because laser dentistry is so much less invasive than traditional dental surgery, patients do not experience the same kind of painful healing process. Patients who no longer have to go under general anesthesia are able to go about with their days instead of going home to rest for at least 24 hours. Because lasers are more precise, dentists no longer have to damage healthy tissues as a side effect of removing cavities, which translates into shorter healing time for patients. To find out more about laser dentistry with Dr. Spalitto, call (314) 821-2712 today.